Be sure to check out Kim's blog at 11 AM EST for a complete list of participating designers. 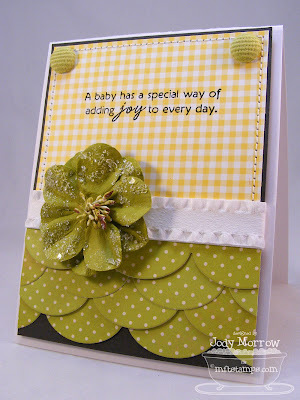 For my card, I used the stamp set, Clearly Sentimental about Babies, which will be released on May 5 @ 10 PM EST in the MFT Boutique. I stamped the image in PTI True Black and then embossed using clear embossing powder. 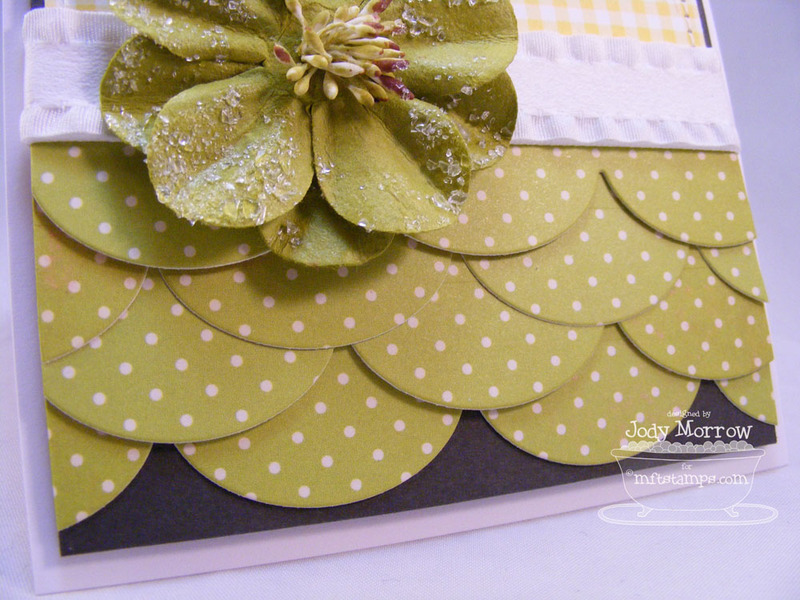 I used my Die-namics Jumbo Scallop to cut out 4 scallops and then staggered them on my card to make a "curtain". I kept it nice and simple in honor of this week's Wednesday Stamp Club, K.I.S.S. To find out what it's all about, check out this week's thread in the MFT forum on SCS. Remember that Die-namics, along with 13 new stamp sets will be released on May 5 @ 10 PM. Mark your calendars! :) There are sure to be sell-outs! :) There has been an overwhelming response to the Die-namics and I can't wait to see what everyone comes up with, using them. It's an exciting time here at MFT! Thanks for stopping by and I'll see you tomorrow! So pretty! Love the colours and that ribbon with all those scallops is just perfect! Oooo, love those layered scallops, Jody!! Great colors, too! I loveeee those polka dotted scallops!! So sweet. I like this latest look on some blogs: the scallop layered look. It really adds to the card; thanks for sharing! Oh now that is NOT KISS!!!! LMAO!!!! Beautiful Card Jody!!!! What's the clear sparkly stuff on the prima???? Pretty card! Love the colors, scallops, and the powdered flower! I guess the word WOW comes to mind! Love it! so lovely! gorgeous scallops-love how you layered them! Gorgeous! Love all the overlapping scallops!